Pros: Easton has developed a lightweight bat with a nice, balanced feel. The Mako has a huge sweet spot resulting in insane pop. When the ball screams off the bat, people around the ballpark will take notice. Cons: The YB14MK may be lighter than what some stronger players prefer. When the bat meets the ball, some say that the resulting collision can leave the bat with scuff marks. But make no mistake; it is the ball that is punished, not the Mako. The Easton Mako has been created for the power hitter who wants to drive the ball harder and further than ever before. While the ball still will take off, because of its light weight and large barrel, some hitters might find the YB14MK not heavy enough. Easton engineers and designers have created a tool that gives players a chance at greater success. Elite players can take their offensive game to new heights with the YB14MK. The big barrel and lightweight stick lets the hitters generate swing speed like no other bat on the market. The key is Easton’s new TCT Thermo Composite Technology. Combined with its performance diamond grip, no energy is wasted when using the YB14MK; hitters get a taste of what it is like to swing a bat just like the pros. This bat features two-piece fully composite designs with balanced swing weights. One warning that could shorten the lifespan of the YB14MK. It was not designed to be used in cold weather. Using the bat in temperatures below 60 degrees could result in damage to the bat. Because of the newest and best technology and design, the Easton YB14MK is a bit on the pricey side, but the results on the field will prove the bat is worth every cent. The investment is a small price to pay to help assure better success at the plate. This bat has been approved for used in Little League, Babe Ruth, Dixie, Pony, AABC, and USSSA play and comes with a 12-month warranty. 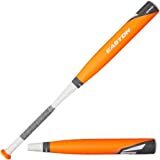 Easton has been producing bats for more than 40 years and has developed a reputation as a leader in the industry with great design, innovative technology and ingenuity. The YB14MK does nothing to dispel that notion. In fact, the Easton YB14MK Mako is our No. 1 choice in the youth bat category — hands down. It’s well worth the price to watch your players build confidence while taking their game to a higher level. Thanks to great handling and an insane amount of pop, it will be just a matter of time before batting averages skyrocket and W’s pile up in the win column. UPDATE: Be sure to check out our reviews of the 2015 Mako Torq and the 2015 Mako Comp!